As I write this letter, I can see you sitting down in your chair reading it. I see you and your beautiful growing belly. It is full of life right now. Life of a baby who you desperately want to be in your arms. Alive. Healthy. You would do anything in your humanly power to get this outcome. But as you and I know, all too unfortunately, that outcome doesn’t always happen. We experienced the unthinkable. We lost our babies. Our hopes, our dreams for the future, gone. You and I have different stories. Each of ours is different, but they also have similarities. We became pregnant again after having experienced a loss. 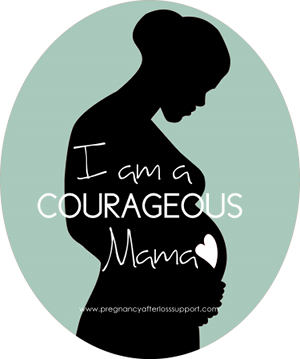 Something that required a lot of strength and courage…and in my case, luck, as it took just over a year to conceive after my loss. My first baby, Marco, was born at 29 weeks on October 6th, 2009. A rare and unknown genetic condition made it impossible for him to sustain his life. My husband and I were forced to make the impossible decision to withdraw care within just a few hours of his life. 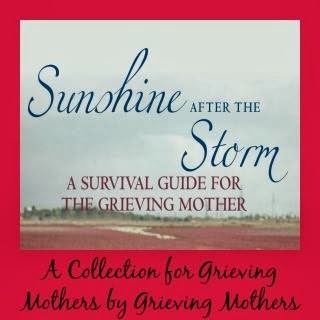 Losing a baby can seem like an endless sea of losses. Not only was our baby gone, along with all of our hopes and dreams for him, but our innocence was gone. Out the window. I was fortunate enough to conceive again 13 months after losing Marco. Sure, I was elated, but I was also terrified. The wait to hit each milestone throughout the pregnancy was excruciating. Having followed all the rules during my first pregnancy, and it still failing, left me feeling out of control. It didn’t matter if I took my prenatal vitamins or didn’t eat deli meat, my baby could still die, and this was a paralyzing fear at times. 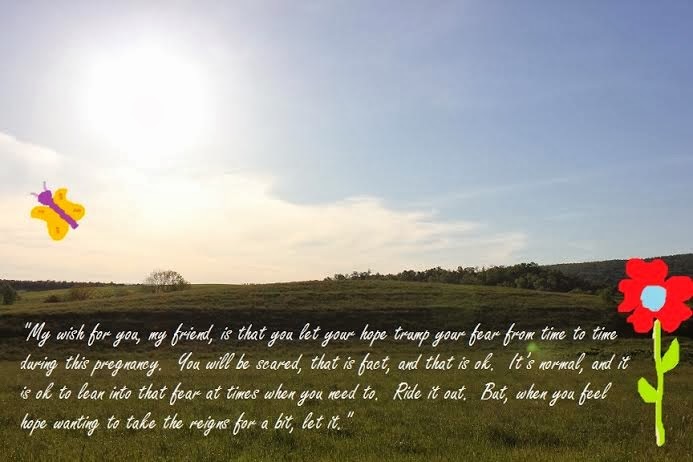 But, weighing against my fear was hope. Despite knowing that anything could go wrong during the pregnancy at any time, I still had hope that this little being in me would survive and thrive. I had to believe. I owed it to myself, my husband, and my little passenger. I vividly remember sitting alone at my table one night during the pregnancy. I was filling out the 2011 calendar with birthdays and known events. I flipped to August, the month during which I was due, and I dared to do something risky. I marked the baby’s due date on the calendar, August 12th, by writing “Little Foot’s Due Date” and drawing a heart around it. My eyes filled with tears and a lump formed in my throat. Risky, to an expectant mother who has never suffered a pregnancy complication or loss, might be an activity like getting your hair colored or eating a big ol’ tuna sandwich. Not to me. Risky meant believing that this baby would survive. Risky was putting Little Foot’s due date on the calendar, knowing that if the unthinkable were to happen again, I’d have to turn the calendar to August and feel the knife turn in my gaping wound when I were to look at the inscription on that date. But hope trumped fear that night, and the due date was marked. My wish for you, my friend is that you let your hope trump your fear from time to time during this pregnancy. You will be scared, that is fact, and that is ok. It’s normal, and it is ok to lean into that fear at times when you need to. Ride it out. But, when you feel hope wanting to take the reigns for a bit, let it. Let it seep into your heart, your soul. Feed it to your baby. It’s scary to let hope take over. There’s a lot at stake, absolutely, but hope is there. It will help carry you through the fear. After all, hope is what gave me the courage to prepare a nursery and to go on a tour of the hospital that I knew would be filled with first-time expectant parents asking typical first-time-expectant-parent questions. It’s what gave me the courage to step into a maternity store and buy a nursing bra. It gave me the courage to compose an outline of an email announcing the birth to friends and family on the day before the baby was to arrive. 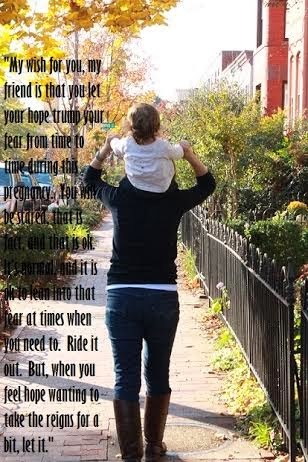 Yes, fear won the tug of war many times during my pregnancy after loss, but hope was there all along and it ultimately won the war. I’m so glad that I let that hope shine through when I could and even sometimes when I didn’t think it possible. We were so extremely fortunate to welcome our daughter, Lucia Elizabeth, full-term and healthy on August 2nd, 2011. She is an amazing miracle and gift. I can’t help but to think that the extra bit of love and gratefulness we have for her is her brother, Marco’s, love shining down. I stand in solidarity with you as you travel this journey. Cry when you need to, laugh as often as you can, but above all else…have hope. Have hope, my friend. 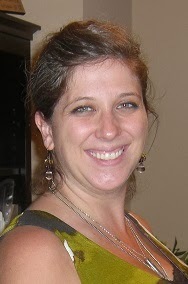 Libby Bianchi is a wife and mother of 2. Her first child, a son, Marco Luis, was born on 10/6/09 at 29 weeks. Marco lived just 4 hours due to a rare and undiagnosed genetic condition. After a very difficult 14 months, Libby was able to conceive her second child. Lucia Elizabeth was born full term and healthy on 8/2/11. 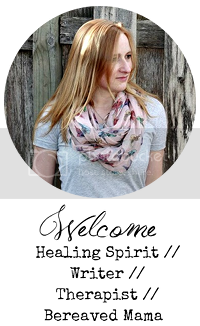 Libby began writing when she started a blog, Somewhere Over the Rainbow, 4 years ago while on bed rest and fighting to save Marco. She has found writing to be extremely therapeutic in dealing with the grief of the loss of Marco and the loss of her innocence. Libby volunteers with the Share Your Story section of the March of Dimes, and also continues to attend a local MIS loss support group to provide support to those who have been forced to walk this walk. Libby is extremely grateful for her miracle rainbow baby, Lucia, a very spirited 2 year old. She and her husband would love to have another child, but are battling secondary infertility, for which they may seek treatment in the future.